For a year now, I’ve been teaching an Adult Ed Acrylic Painting Class for the Farmington Hills Special Services Department. Although all levels are welcome, I especially love teaching beginners, including people who can’t draw and have never painted before. Recently, they made a video promoting my class, which you can watch below. If you’re interested in taking my class, or any other of the terrific classes offered, check out their website to look at their newsletter. We haven’t had any real snow so far this winter in metro Detroit. To my surprise, I miss it. Snow is a lot of fun to paint when I do plein air, especially if the temps are in the high 20s, low 30s with little wind and the sun’s out. With conditions like that, it’s not hard to stay outside for 3 hours and do a painting with warm pale colors for the sunlit snow and cool bluish-purples for the shadows on them. 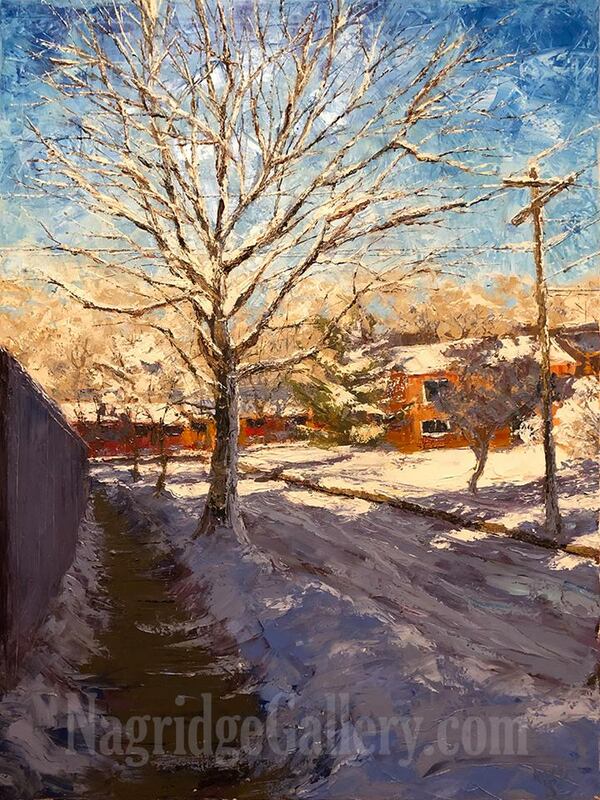 In fact, my last plein air was the snow painting done in early December, 2018. When it’s colder, I wear disposable hand warmers in my gloves and foot warmers in my boots, along with layers of clothing when I paint outside. I admit, if it’s too frigid, I just take photos and store them for references for studio photos. Done Shoveling is a studio painting using photos I took as reference. This is my side street after an overnight snowfall. I’d just finished shoveling my walks. It must not have been a lot of snow that fell that time since it looks like I used a shovel instead of my snow blower. But it was clear I was enchanted with how the snow covered the branches of the trees and even the utility wires. I’m guessing it was either too cold to paint it plein air, or, more likely, I had to spend the rest of the morning doing errands so I didn’t have time to set up my easel to paint on site. 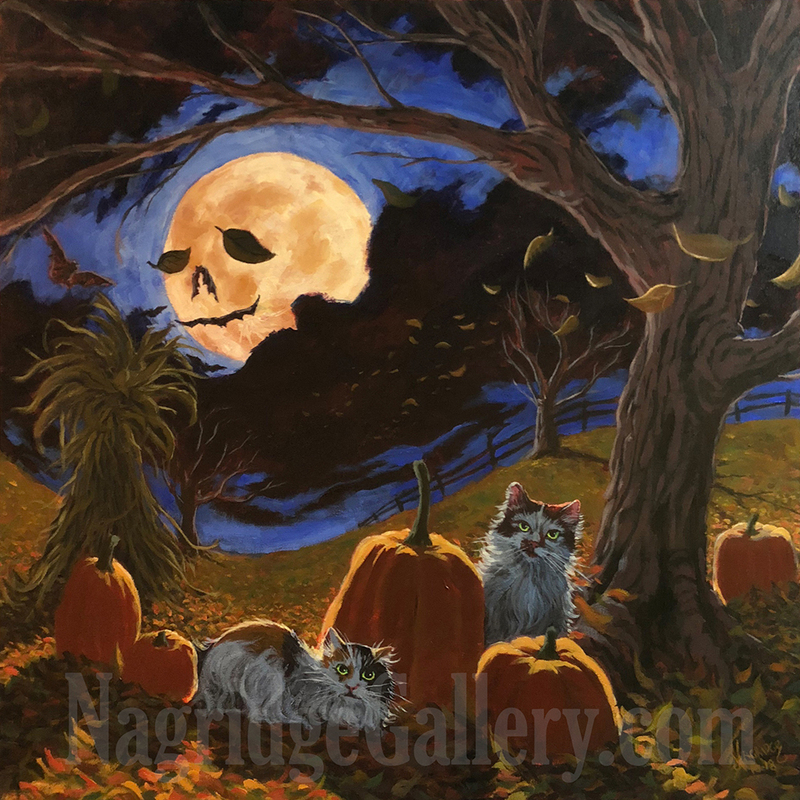 It’s a 30″ x 40″ oil on canvas, mostly painted with painting knives. After a couple days working on it, I didn’t like the patchiness I was getting in the sky and the snow from the knives I was using. It was clear that a large canvas needed a larger blade to apply the paint. In my oil paint toolbox, I had a 4″ scraper for patching drywall. I usually use it to clean my palette in my studio, but after getting frustrated with the look of the sky, I used it to apply and scrape the paint. I immediately loved the effect I was getting and used the scraper on the snow, as well. I also used its straight edge to apply ling, thin lines of paint in places. I did this painting specifically to hang in our back living room. When it was finished, I hung it up immediately on the screw in the wall in the back room I inserted there just for hanging the various large paintings I’ve done for different seasons of the year. I had the foresight to wire the stretched canvas before any paint was applied to it, knowing I would just let it dry while it hung on the wall. To help it dry even faster, I mixed Gamblin cold wax medium with my paint before I applied it with my knives, something artist Kim Rhoney taught me. This wonderful stuff extends the paint, retains the beautiful textures applied with the knife, and helps the paint dry in about half the time. When completely dry, the paint has an even matte luster to it. The forecast for metro Detroit calls for snow this weekend. 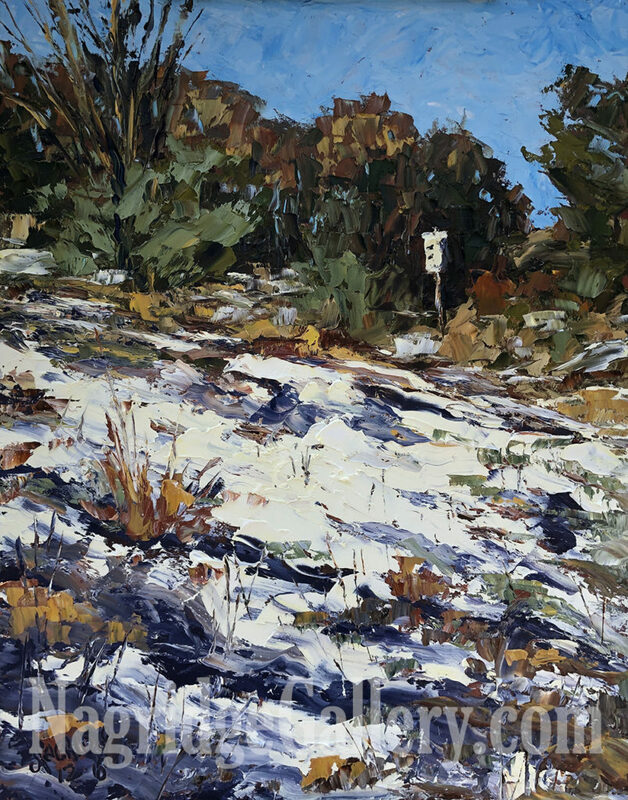 Here’s hoping the next snow painting from me will be a plein air! Early this year, I started a new part of my life as an Adult Ed teacher of Acrylic Painting for the Farmington Hills Special Services Department. 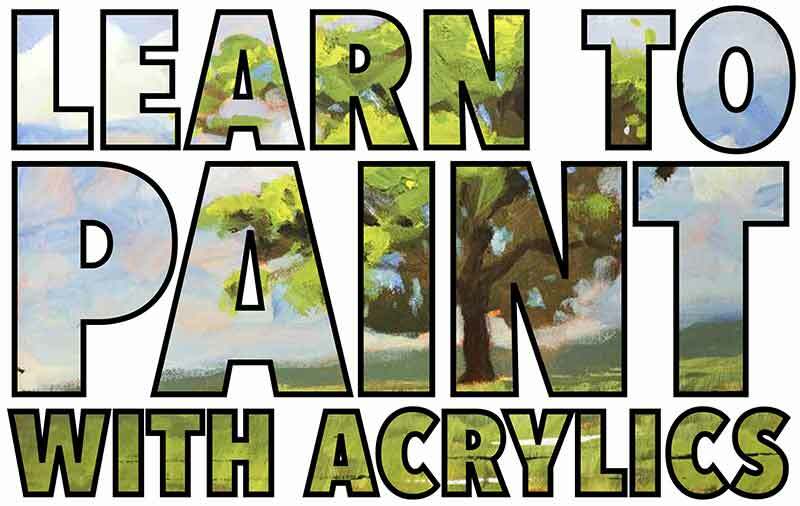 If you live in or near Farmington Hills, MI and have always wanted to try Acrylic Painting, you may want to check this class out. The class is on Wednesday evenings for six weeks. I try to make the class fun and informational. Feel free to email me with any questions you may have on the class. Click the Download button below to download a pdf of the flyer.